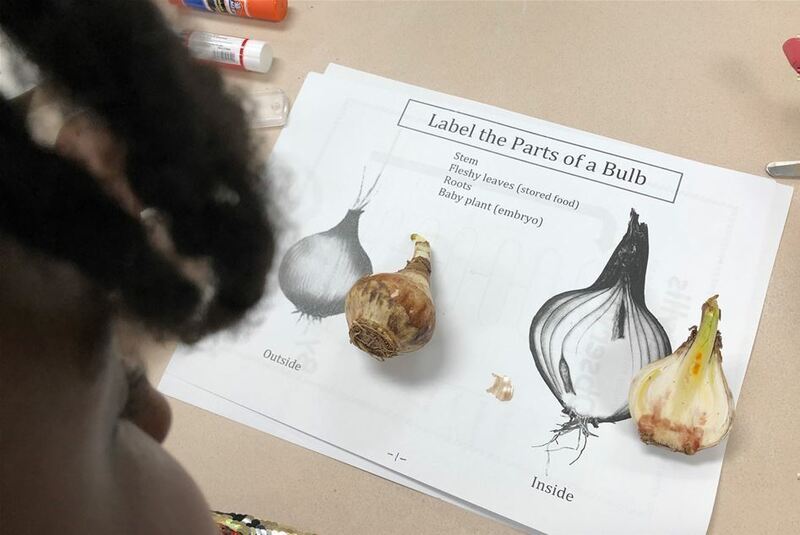 Third grade students in Mrs. Larkin's and Mrs. Joy's class studied bulbs with Joyce Kent and Naomi Gams-Towers from Hudson Park Children't Greenhouse. They learned the parts of a bulb and examined a dissected Paperwhite bulb with magnifying gasses, then set up a whole bulb in water and pebbles to grow. They explored Amaryllis bulbs in more depth -- weighing them and measuring their height and circumference, as well as using their senses of sight, touch and smell to describe them. All of this was recorded in the Amaryllis Observation booklet. Finally they planted the bulbs and entered the date on the Data sheets, where they will keep track of growth and change. Each bulb "belongs" to 4 students who will be in charge of their care. Mrs. Kent and Mrs. Gams-Towers will come back when the blooms are ready to be pollinated and again when, hopefully, seeds have been produced.